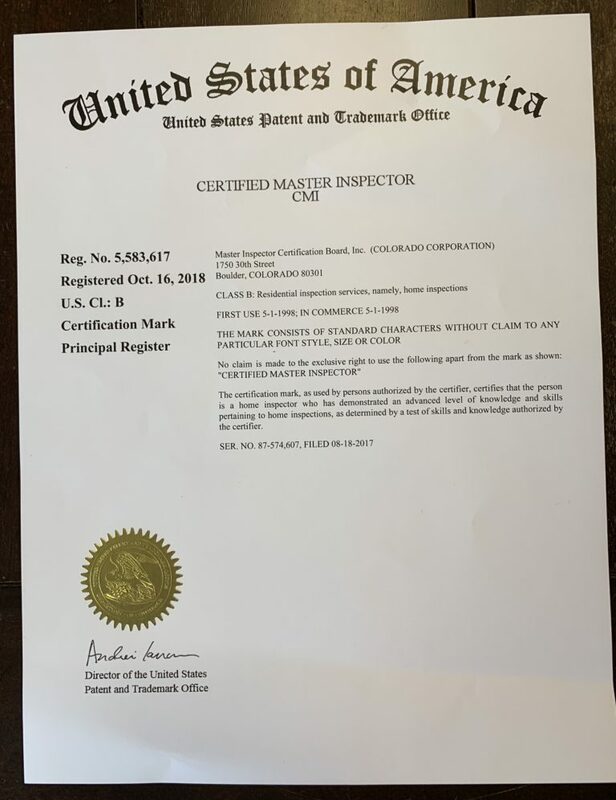 The Master Inspector Certification Board has been awarded four Registered Trademarks: Three Federal Certification Marks on the U.S. Patent and Trademark Office’s Principal Register as well as a Canadian Registered Trademark. 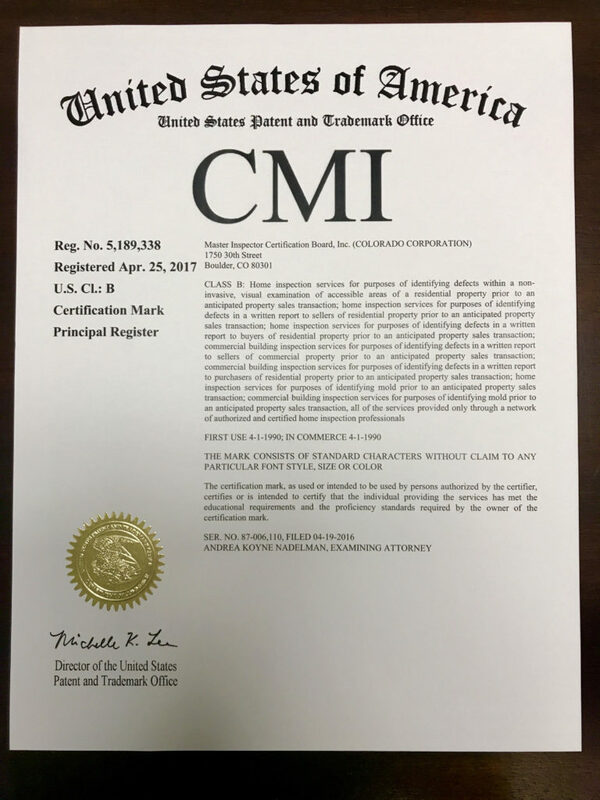 The four Trademarks are Certified Master Inspector, CMI®, Certified Master Inspector®, CMI® and Certified Master Inspector (CMI)®. The four applications were filed in 2003. All four Trademarks have since been awarded and all three U.S. Federal Certification Marks have been placed on the Principal Register. See below for an understanding of the Principal Register. The U.S. Registered Trademark was awarded by the U.S. Patent and Trademark Office (USPTO). The approval processes took 15 years and were made possible through a transfer of interest donation from Certified Master Inspector® Nick Gromicko. The Canadian Registered Trademark was awarded by the Canadian Intellectual Property Office (CIPO), an Agency of Industry, Canadais listed under the CIPO index: Residential, commercial and environmental inspection services. 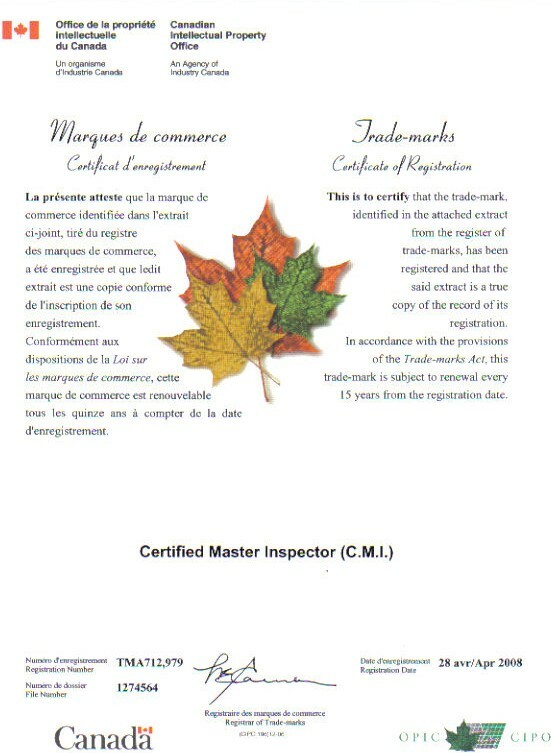 The approval process took two-and-a-half years and was facilitated by Certified Master Inspector® Roy Cooke of Ontario. While a Principal Registration is prima facie evidence of the registrant’s exclusive right to use of the mark, a Supplemental Registration has no such evidentiary effect. While a Principal Registration is constructive notice of claim of ownership so as to eliminate a defense of good faith, a Supplemental Registration has no such effect. While a Principal Registration may become incontestable after five years of registration, a Supplemental Registration can never achieve that evidentiary status. While a Principal Registration can be used as a basis for the Department of the Treasury to stop importations of infringing products into the United States, a Supplemental Registration cannot. While a Principal Registration receives protection as a valid trademark in litigation, a Supplemental Registration will not, prima facie, receive protection as a valid trademark because its very presence on the Supplemental Register indicates a preliminary determination that the mark is not distinctive of the applicant’s goods. 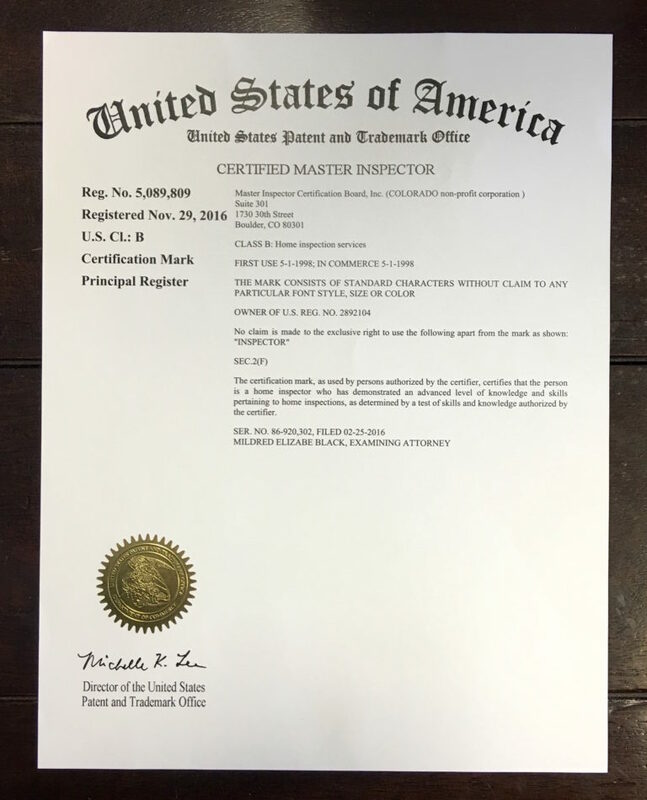 How to use your Certified Master Inspector® professional designation to give your home inspection business a huge boost.